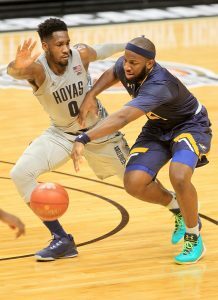 There seems to be a tone for the Hoyas this season, play as close as you can for the first half or even most of the game, today they did the first, but somehow used a strong effort by L.J Peak in the second half finishing with 24 points as at the game’s MVP. Prior to the meeting today Hoyas Head Coach John Thompson III said that this game was going to be close, he was sort of right on the money and his team came on stronger in the second half in the final minutes than they have all season. Jordan Price scored 23 points for La Salle (4-4), which got 19 more from B.J. Johnson and 10 from Pookie Powell. The Explorers were outscored 36-22 from the line, getting there 10 fewer times than Georgetown. It was tied at 67 with 8:44 left, before the Hoyas finished on a 26-11 run. During the game Hoya Great and Miami Heat Championship winner Alonzo Mourning was recognized as part of the HOF guests that included Pat Riley as well. Mourning was part of why the Hoyas appeared in the tournament. Trey Mourning wears No. 33, just like his dad did at Georgetown and for the Heat. He got into the game for the final 23.2 seconds, as the Hoyas ran out the clock.